The threats of scissor, screwdriver, knife and electric drill on phone screen are nothing. Meet the Spigen's Steinheil GLAS.t screen protector. The 0.4mm thick screen protector is made with specially processed chemically threated, transparent tempered glass to protect screen from shocks and scratches. Its surface hardness is 8-9H which is much higher than other normal screen protector with just 2-3H. The static cling between the GLAS.t and the LCD maximizes touch-screen sensitivity. Spigen claims it is anti-shatter film. GLAS.t will break into small piece like car mirror if broken, making it safer to use than other glass products. 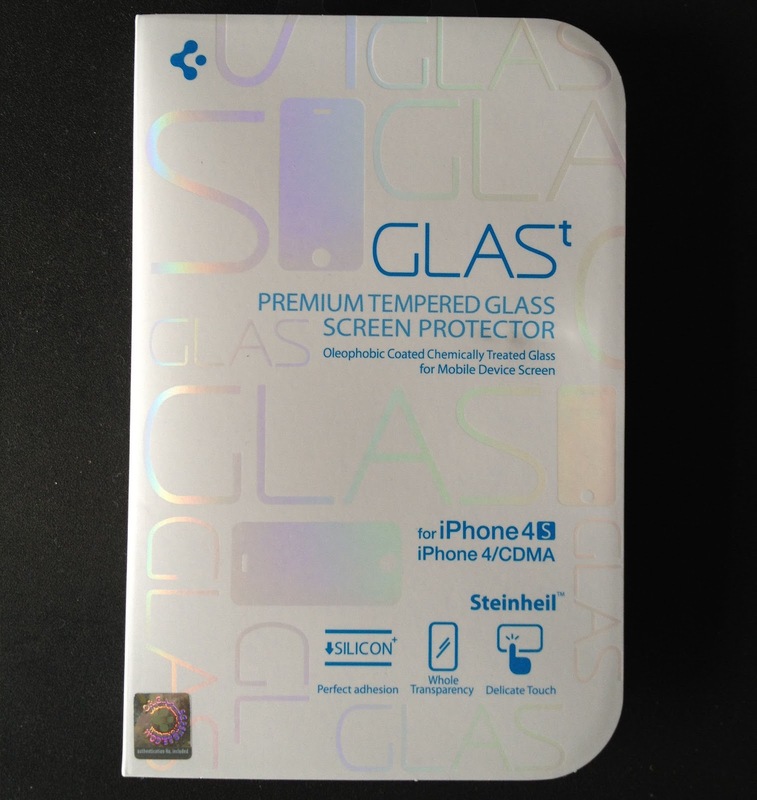 The SGP Steinheil GLAS.t is one of the best screen protector in the market. The screen is very clear that you will hard to notice there is screen protector on it. 0.4mm is thick but the touch screen's sensitivity is not affected. 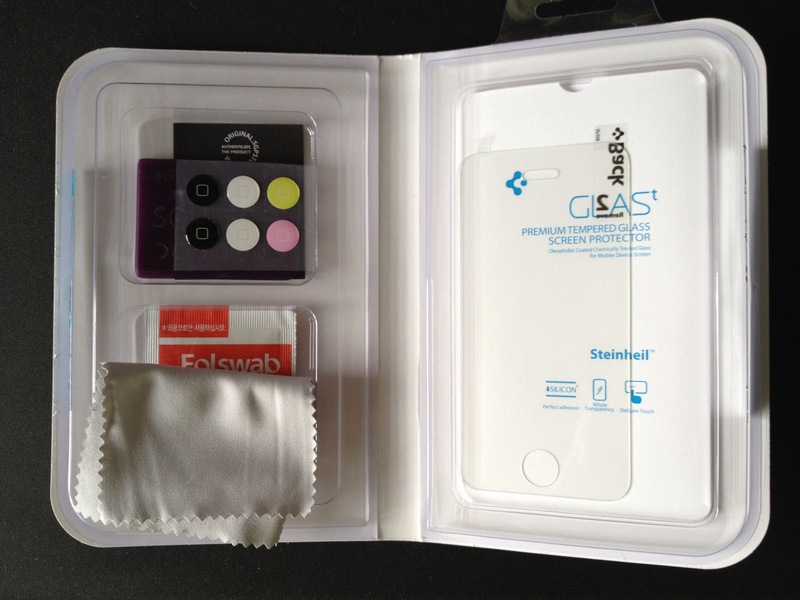 Unlike the normal plastic screen protector, tapping and swiping on glass is very pleasing. I believe GLAS.t is scratchable but it will be extremely hard to be scratched. I have been using it for weeks now and zero scratch so far. The Oleophobic Coating is doing its job nicely as well. It attracts least fingerprints and smudges. Stubborn fingerprints and smudges can be easily cleaned with cloth. The home button stickers are a welcome features to fill the 0.04mm depth gap between home button and screen protector. It is difficult to get a proper alignment installing GLAS.t since you only have one shoot putting it on the iPhone. Once it's installed, it's installed. Trying to lift it up again might broken the GLAS.t so the room for error is minimal. Spigen should have provide a helping tool to align and install the screen protector properly, especially this premium tempered glass. The product claims smaller bubbles should disappear within 1 or 2 days. However, I get a few small bubbles around the edge of the areas like earpiece, home button and screen protector itself. Any phone case which covers the area of screen protector might probably incompatible with GLAS.t. Case like Speck CandyShell is as far as you can go. Although GLAS.t is a bit pricey, I think it worths buying for it's toughness and retina screen clarity if you're seriously care about the screen protection.